Hard-shell guitar cases are typically made with wooden exteriors covered by a protective coating, such as canvas or hardened plastic. The interior of guitar cases are covered in soft fabric, such as felt, and Styrofoam that is cut to fit the type of guitar stored inside. Making your own hard-shell wooden guitar case is not difficult if you are willing to stick with a coffin-case design that is easier to cut than other styles of hard-shell guitar cases. Lay your instrument on your workbench and measure the dimensions of the guitar with a tape measure, noting the width and depth of the guitar's body as well as the length from end to end. Taking the dimensions for the length and width of the instrument, add 1 to 2 inches, depending on how much padding you want, to transfer the measurements to a sheet of plywood for the top and bottom of the guitar case. Trace out two rectangles on a sheet of plywood using the guitar case dimensions for the width and length. Cut out the rectangles using a jigsaw or skill saw. Measure two ¼- inch panels and cut them to the length of the guitar case. The width of these panels should equal your depth dimensions from Step 1. To complete the frame, cut two ¼ -inch panels of the same depth but measured to the width of the case. Use spray-on cement and finish nails to join the ¼-inch panels into a frame that equals the dimensions of the guitar case bottom. Nail and glue the frame to the bottom of the guitar case. If you need a sturdier case for your guitar, or will be on the road with it, consider using small L-brackets to reinforce the joints and corners of the frame and another set of L-brackets to reinforce the joining of the frame to the plywood sheet. Stretch out one big sheet of canvas fabric over the bottom of the case and the frame, gluing it in place and wiping your hand over it to smooth out any wrinkles. Alternatively, you can also paint on a plastic protective covering such as the kind typically used for truck bed liners. Measure a block of Styrofoam to match the dimensions of the case interior and cut it with a sharp knife. Place the Styrofoam into the guitar case and put your guitar on top of it. 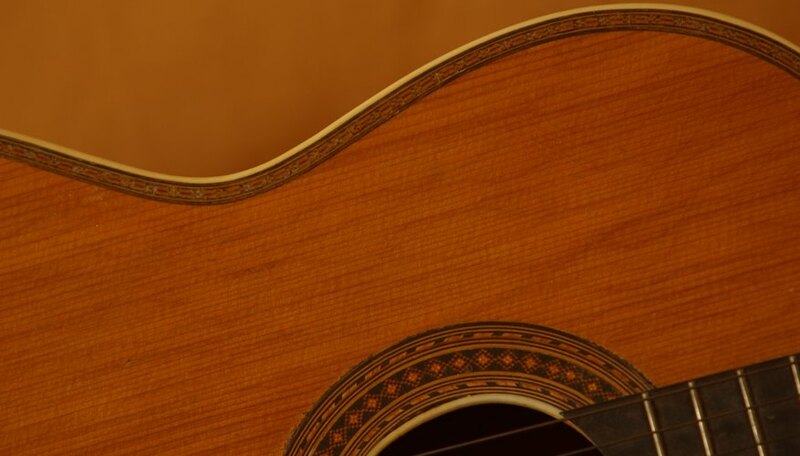 Use a marker to trace the outline of your guitar to ensure a snug fit. Cut out the traced guitar outline from it and glue the remaining Styrofoam into the case. It may be easier to cut two large pieces of Styrofoam -- one for the guitar's body and one for the neck. The Styrofoam block should have roughly the same depth as your guitar. Cover the Styrofoam and the interior of the guitar case with a large piece of soft material, such as fleece or felt. Glue the soft material into the guitar case and allow it to dry. Measure and cut four ¼-by-1-inch strips into a frame, nailing and gluing them together as in Step 3. Secure the frame to the top of the guitar case as in Step 4. Cover the exterior of the top half of the guitar case with canvas, repeating the process from Step 5. Glue felt to the interior of the top half of the guitar case as you did in Step 7. Set the top half of the guitar case on top of the bottom half. Looking at the case as a whole, screw in three to four hinges with a power drill on the right side of the case, joining the two halves. On the left side of the case, join the two halves with three to four latches spaced evenly apart. Screw in a handle between a set of latches near the middle of the guitar case so that it is balanced when you carry it. How Do You Make a Coffin-Shaped Guitar Case?